According to Korean-language publication The Bell, by 2019, Apple will utilize OLED displays in all of its newly released smartphones. Apple has reportedly signed two multibillion-dollar deals with Samsung to supply the AMOLED displays: the first for 100m displays and the second for an additional 60m displays, which should get them thru 2018. Rumors suggest that Apple will stick to LCD for the expected iPhone 7S and 7S Plus, but in a few years time OLED could become the new normal. The Bell reports that sources in Apple's supply chain claim current OLED display production will account for 40 percent of this year's iPhones. (Seems rational, as the iPhone 8 will be introduced in September.) Next year, that percentage is expected to double, and then reach 100 percent in 2019. This report suggests that Apple will begin phasing out the old LCD displays until all new iPhones are released with OLED displays. In order to keep up with Apple's demand, display manufacturers like Samsung, LG Display, Sharp, JDI and BOE are building or expanding factories in Asia. Currently, only Samsung has orders. Apple is expected to release at least three variants for the tenth anniversary of their iPhone product line with the iPhone 8 being the only one to carry an OLED display. SCMR reports that Samsung Display and LG Display account for 90.7% of raw OLED capacity as of Feb 2017) and 92.7% of utilized (available) OLED capacity, which leaves only modest capacity for other producers. Given that virtually all of LG Display’s production OLED capacity is oriented toward large panel (TV) production, the numbers are skewed even more toward Samsung Display and as Samsung builds out its A3 and L7 fabs, their share will peak in 1Q 2018. Moreover, DSCC reports that Samsung will continue investing in OLEDs and will outspend the cumulative capex of all the OLED competitors thru 2021. 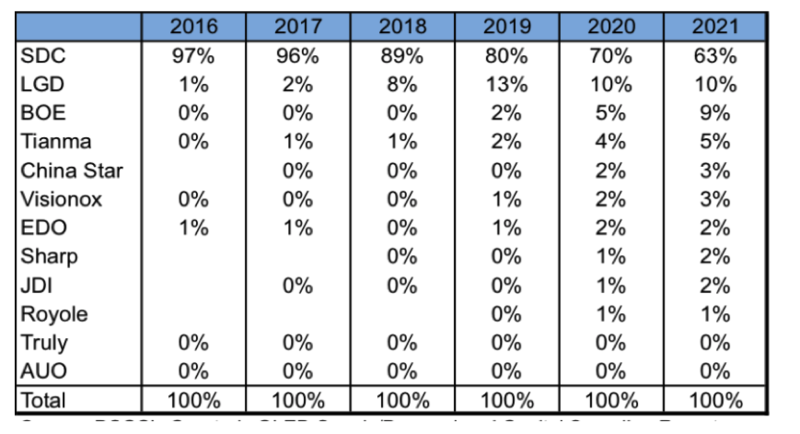 DSCC forecasts mobile OLED display output shares by panel supplier in Table 1.